The Stratford WSD guild is an enthusiastic and friendly group of weavers, spinners and dyers. Visitors are most welcome to attend any of our meetings to see what we do and learn about our crafts before deciding whether they wish to join. We have a varied and interesting programme of weaving, spinning and dyeing but also include the history of textiles, felting, braiding, card making, crocheting, knitting and other related fields. 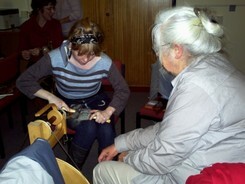 Our members hold a variety of skills and interests, from growing natural dyes to ply-splitting. We love to pass on our knowledge and we hope to inspire each other to expand our skills and knowledge. Check out the Meetings page and come and visit us, or catch us at one of our frequent demonstrations. Click on the WSD Stratford History page to find out more about the group. Our members come from a wide area, including Rugby, Bromsgrove, Coventry, Leamington Spa, Knowle, Birmingham and, of course, Stratford-upon-Avon. 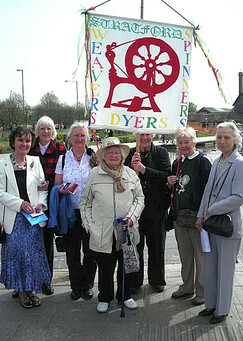 The Stratford-upon-Avon guild is one of over a hundred British WSD Guilds affiliated to the national Association of Guilds of Weavers, Spinners and Dyers (www.wsd.org.uk). Its objectives are the preservation and improvement of craftsmanship in hand weaving, spinning and dyeing.